With manufacturing facilities in Garner and Benson, NC, Hamlin Sheet Metal is a nationwide provider of rectangular, round, flat oval, spiral, and welded duct systems. Hamlin Sheet metal has been providing commercial and industrial market customers quality sheet metal and duct fabrication services for over 60 years. 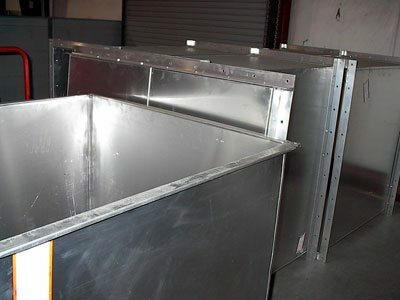 We specialize in rectangular duct fabrication for a broad range of commercial and industrial facilities throughout the Southeast and nationwide. At Hamlin, our rectangular duct systems are estimated and fabricated in strict accordance with SMACNA and ASHRAE standards. We utilize our 100,000 square-foot manufacturing space and the latest rectangular duct fabrication technology to make this possible. Detailed, color-coded CAD drawings are produced for each rectangular duct fabrication job to ensure the very best form, fit, and function. Each piece of the duct system is color-coded for quality control and chronologically labeled. Corresponding piece-marked installation drawings are provided to each client to facilitate ease of installation. Our goal is to achieve 100% customer satisfaction with every rectangular duct fabrication project. A network of manufacturer representatives, our in-house engineers, and our expert production staff are ready to assist you in the design and fabrication of your high-quality rectangular duct system. For detailed product specifications and submittals, please see our Resources page.